SWIM, SURF, SUN, FUN at a private FIRST FLOOR 'Carolina Cottage' in Hidden Dunes Beach and Tennis Resort. This lushly landscaped 27 acre GATED COMMUNITY is right on the sugary white beach of the Emerald Coast and offers privacy as well as numerous amenities and activities. Hidden Dunes is just a half mile east of the Silver Sands Factory Stores Outlet Mall and just minutes from both the Destin Commons shopping complex and Baytowne Village. The well known Sandestin golf course is less than a mile from the cottage. Numerous restaurants and recreational opportunities are very close. The quaint towns of Seaside and Watercolor are just minutes east. The largest of 3 SWIMMING POOLS and the JACUZZIS are only steps from the cottage door and the 6 clay TENNIS COURTS are a short stroll away. You can RELAX and SOAK by the heated POOL(seasonal) The kids and adults will enjoy the BASKETBALL courts and two HORSESHOE courts as well. STROLL the scenic fountain lined path on the way to the BEACH. The walk to the beach is short, but should you want a ride, there is a seasonal free tram that runs from the cottages to the boardwalk -- hop off the tram and you are at the beach -- fun for the kids, great for the tired parents. There is a pet boarding kennel close by, off the property -- DOG DAYS KENNELS, for those with pets who travel. This cottage has all the comforts and amenities of home while providing an exotic Florida RETREAT. Experience comfortable living with two bedrooms, two bathrooms, nine foot ceilings, a washer and dryer, and a LANAI with an outdoor bar and stools. The SPACIOUS master bedroom provides all the privacy with your own UNIQUE DUAL SHOWER while the second bedroom offers the comfort of a private hallway and space with a queen-size bed and full bath. Free WIFI throughout the cottage and resort. This retreat sleeps a total of 4 people comfortably. The clean, open kitchen is fully equipped with all the essentials you'll need to prepare everything from a light snack to a gourmet meal. Karen and I love the emerald coast and Hidden Dunes has been the perfect location to enjoy all that the coast has to offer. The resort is private and 'tucked away', yet close to everything including shopping, recreation, and dining. A wonderful setting especially for families. Simply a great place to visit anytime of year -- come join us! Master bath had dual shower and sitting bench. A short walk to the ocean, no roads to cross -- free seasonal tram if you prefer to hop on or haul your beach items or coolers. 3 pools, hot tubs, basketball court, horse shoe pit, shaded trails, fountain line pathways, beach service, free WIFI, tennis courts, tennis pro on site, and 24 hour gated security. Dining table, 2 bar stools inside, 2 bar stools outside on lanai, and table for 4 on lanai. My family enjoyed our time and would go back! Very impressed with the quaint cottage in Hidden Dunes. You are still in town but feel like you are tucked away from all of the business of town. The clean large pool is almost right out of the back door. Parking is also right outside the back door. The community is very quite and comfortable, you feel like you are at home. The cottage is very nice and cozy. I would stay there again. We arrived for our week's stay at Hidden Dunes recently. This cottage is really nice. It is comfortable and equipped with everything you'll need. 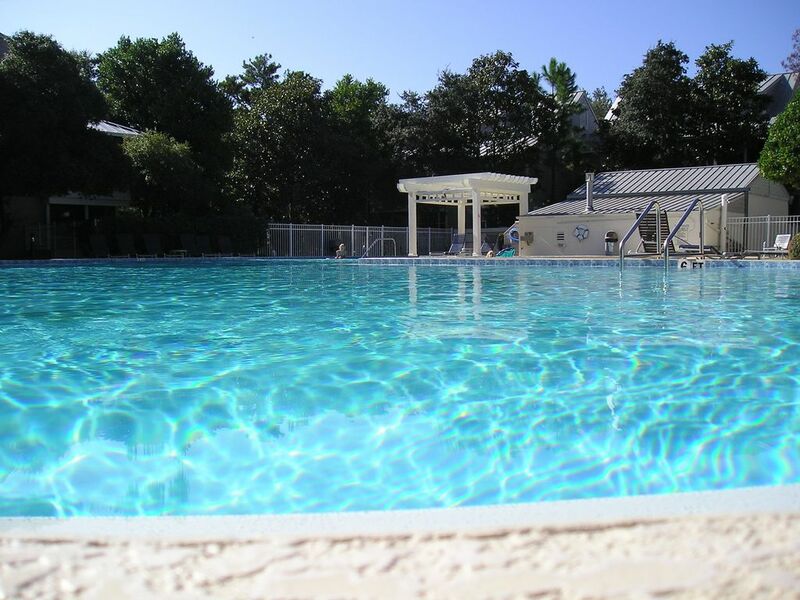 Parking is right outside your front door, gas grills nearby for cooking out, and a short walk to one of the pools. The walk to the beach is a little longer but you will have nice walkways, with shade, on your way. The area is very neat, clean, and quiet. We were disappointed that the chair rental people filled the entire beach with their stuff leaving very little to no room for people who choose to bring their own chairs to the beach. And only about one-fifth of their chairs were used. If not for this issue, I would definitely return. If you are looking for an easy getaway, look no further than Cottage 222! My husband and I took our 13 month old son on his first flight and beach vacation to Hidden Dunes, Cottage 222. Everything about the trip was EASY! Communication and instructions from Doug the owner are straightforward and clear. He mails a welcome packet prior to your trip. The pictures do not reflect how beautiful this first floor cottage is! The furniture is new and contemporary and the sofa is a sleeper sofa, which we didn't need, but is good to know! There are two large, lovely bedrooms, each has its own bathroom. LAUNDRY! You can do laundry before heading home, just bring your own pods or purchase liquid at the grocery. The kitchen has everything you need to cook meals. The lanai is a great place to eat, play games, or have morning coffee. The grounds of the resort are clean and stunning. It's such a relaxing place! You'll stay cool under a thick shaded canopy of native trees and plants that very well taken care of. The pools are pristine and within steps of the cottage! BEACH ACCESS! Let's talk about the beach! There is a seasonal tram that will take you to the beach, just give them a call, or you can stroll through the resort in less than 5 minutes and get there just the same. The walk was easy even with a 13 month old and all of our beach items. The beach is amazing, it is private access, private beach. Each time we were there, we were the only ones using the chair and umbrella service. The location of the cottage is about 30 minutes from Ft.Walton/Destin airport. Immediately nearby are great beach front restaurants, grocery stores, drugstores, and the outlets. Truly a wonderful place and I feel lucky to have happened upon this listing! We are looking to come back in March and will make this our go to accommodation for the Destin/Miramar beach area! We had a great week stay at the condo! The weather was beautiful and the beach even better. Loved the screened in porch and living space of the condo. Would love to stay again! We can't say enough good things about Doug and Karen Wiles' property. It has everything you need to feel at home, plenty of room and was in a very good location, close enough to the fun stuff, but far enough to not be in the middle of all of it. Destin is maybe five miles away, with plenty in between. The unit itself is comfortable and spacious, especially for a week. The bedrooms are good-sized, with separate baths, and the living space was not cramped. The kitchen has enough gear to make just about any kind of meal, the appliances all worked very well -- especially the ice-maker, which was huge -- and there's a nice pantry to store non-perishables. We never went onto the screened-in porch, because it was so hot outside, but could see where that would be a nice place to spend some time playing games or just listening to a thunderstorm. The proximity to the beach and pools is very manageable. The largest of the three pools, which is very good-sized, is about a one-minute walk. The beach access point is no more than a 10-minute walk if you don't want to call the shuttle, which we saw driving throughout the days we were there. The beach is amazing. We visited during peak season and it was not crowded. The sand is bright white and fine powder, what you might expect in the Caribbean. The water was clear and refreshing. The name "Emerald Coast" makes a ton of sense when you see it. By far our favorite beach we've visited. We have seen complaints on here about the size of the TV and laughed because, had there been no TV, we might not have noticed. There's an ocean with cool powdery sand just a few hundred yards away. We have a TV at home. We hope we can go back sometime. On-Site, Private Beach with chair/umbrella rental available, short walk to beach with no roads to cross, seasonal tram for short ride to beach, 6 clay tennis courts, tennis pro and pro shop, 3 pools for swimming, sunbathing and 3 jacuzzis. There is also a fully lit basketball court, small playground, and a horseshoe court. Free WIFI throughout resort. Enjoy the lush walking paths with beautiful fountains and water ways. The resort has 24 hour security and a gated entrance. Just a short walk up or down the beach you'll find, jet skis, parasail, and windsurf rental. Just a short drive you'll find, boating and pontoon rental, scuba, water parks, the towns of Seaside and Water Color, as well as state parks and reserves. Hidden Dunes Resort is a family oriented resort -- 25 years of age to rent, per the resort policy $105 cleaning fee, and returnable security deposit of $100. Discounts for weekly stays. Saturday to Saturday weekly stays only during summer peak season.